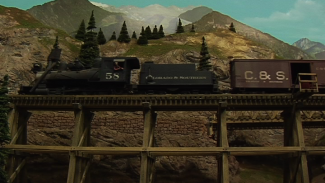 Modeler Josh Clark shows how to renumber a factory painted locomotive in this video. 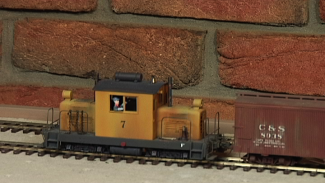 Sometimes the locomotive being modeled in real life doesn’t come in the same number from the factory, so it must be renumbered. The whole thing can be repainted, but Josh shows a quicker easier method that requires simply removing the numbers and adding new ones. This requires decals, a locomotive, a couple of q-tips, a paint brush, micro sol, and micro set. Josh uses the brand Microscale industries, which can be found online. Micro sol serves two purposes. Usually it is used to adhere decals to cabs, but here Josh is using it to remove the numbers. 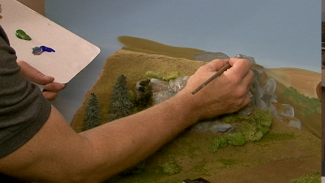 With a paint brush full of micro sol, he brushes over the decal. This is not as strong as paint thinner, so it won’t remove the paint job underneath. The liquid eats away at the top layer of white paint numbers. This has to be applied about ten times and let sit for ten to twenty minutes to really soak in. Next he uses a number eleven exacto blade, a slightly dull blade works better because it is less likely to scratch the paint underneath. Josh gently scrapes the numbers off, keeping it wet with the micro sol while working so it comes off smoothly without scratching. After dry, the decals and clear coat is applied. Josh uses decals from Microscale, which has a great website for finding what is needed. The wet transfer decals must first be soaked in water. 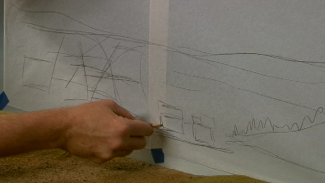 A little film on top of the paper comes off in water and then can be applied to the side of a locomotive. Josh likes to use a brush to wet his decals rather than placing them in water to make them easier to grab later. Watch the video to see how Josh applies the decals.